Michelle is the Office Manager at the Arnold location. She has been with the practice since 2000, and enjoys seeing the returning patients year after year. 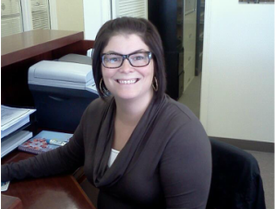 Michelle likes to educate the patients so together they can find the eyewear that best suits their individual needs. She has extensive knowledge in Optical as well as Insurance billing, and will be happy to help find the best benefits your insurance can offer! When Michelle isn’t managing the office, she is spending time with her family and enjoys rooting on the St. Louis Cardinals.